As our readers know, we adore a good hiking adventure, especially when it involves exploring off-the-beaten-path areas of the world. 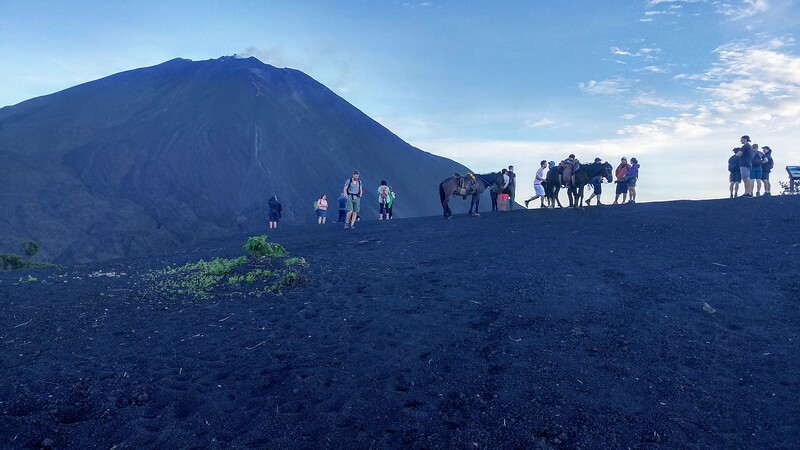 Guest contributor, Kirsten Gallagher, is here to share her experience in Guatemala where she trekked up an active volcano on a Pacaya Volcano hike. 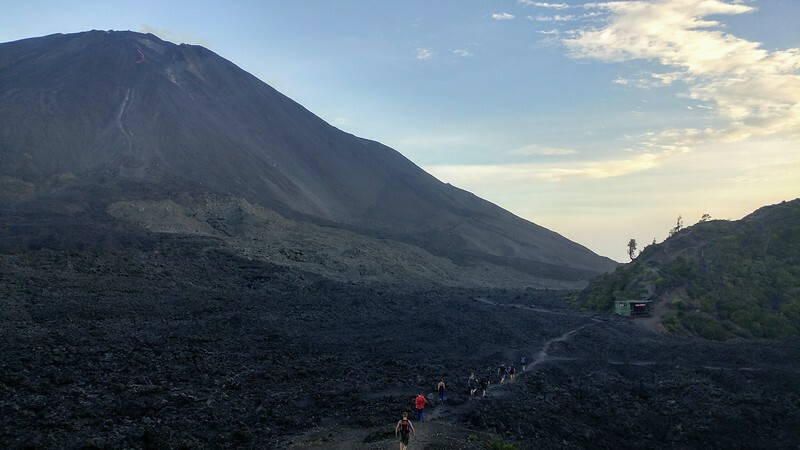 Get your hiking boots, grab some water, and enjoy this adventure located just outside of Antigua! I hate to admit it but I’m already out of breath. The stone steps at the beginning of the hike are irregularly-shaped; I wobble as I reach for the next one. Thankfully, the air is becoming cooler the higher we climb and the leafy trees offer generous shade. I’m with a group on a two hour hike up Pacaya Volcano, just outside of Antigua, Guatemala. Once we reach the top, we’ll be hovering at an altitude of 2,552 meters, or 8,373 feet. I tell myself it’s doable. 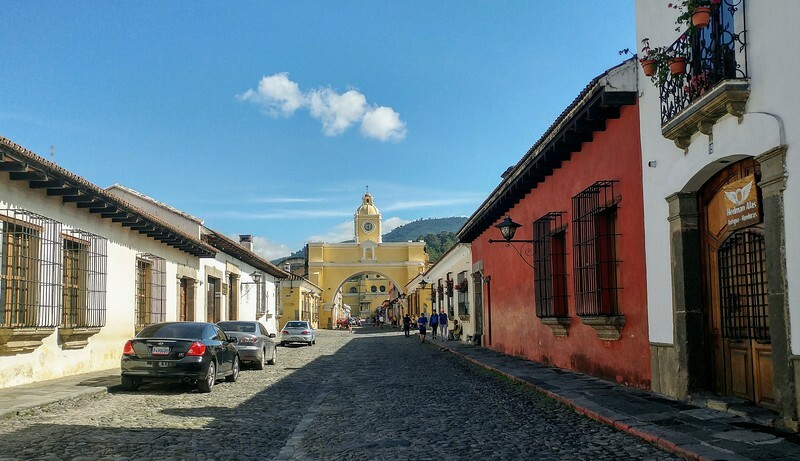 Antigua, a UNESCO World Heritage site, is a city for travelers of all walks of life. Backpackers descend upon it like locusts for its range of cheap accommodation and food. Language lovers come to brush up on their Spanish for weeks at a time. History enthusiasts are keen to take in its glorious baroque churches and crumbling convents. Active individuals challenge themselves by climbing up one (or two) volcanoes. Pick a point anywhere in Antigua and chances are, you’ll be able to see a number of different volcanoes, many of them still active. 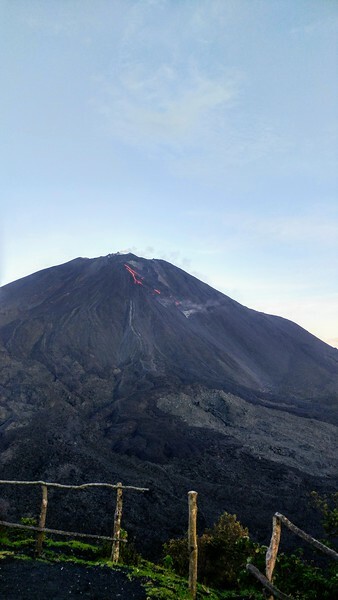 There’s Agua Volcano, Fuego Volcano and, for more serious trekkers, Acatenango Volcano, which requires camping overnight. I wasn’t in the mood for anything too arduous and so the trek to and up Pacaya sounded about right for me. Walking up to a smoking volcano is a bit intimidating. You can easily organize your hike the day before. As you’re walking around and getting your bearings, you’ll inevitably see many competing companies charging more or less the same price. The company that I hired (New Destiny, 5ta Avenida Sur 10) informed me that although the hike would not be too challenging, I should nevertheless make sure to bring lots of water and pack rain gear. With all those clouds encircling the volcano peaks, the weather can change quickly and afternoon rains are common. This our view during the ascent. Not bad at all. Our guide Edwin wants to know if we’re ready before we set out and so he asks enthusiastically, “¿Listos?”. We’re a mixed group. There are people of different nationalities, ages, fitness levels. Those who are not so sure about the endeavor before them are eyeing the horses. For a fee, a local will sling you over the back of his horse if you become too tired during the climb. As it turns out, I don’t need a horse. I’m successfully making my way up the volcano bit by bit, distracting myself by practicing my Spanish with a mariner from Chile. Edwin allows us breaks every fifteen or twenty minutes. “¿Cómo están?”. For the most part, we’re fine. He cracks a few stock jokes about how the volcano is going to explode. I don’t buy it, but the idea is reason enough to get a move on. Planning a hiking adventure? Start your research at our Favorite Hiking Trips page. When we finally made it to the summit, we were greeted with this gorgeous view. Fatigued, we reach the top just as the sun is beginning to set. Agua Volcano, Fuego Volcano and Acatenango Volcano are all within sight, as is the small town of San Vincente Pacaya. The dimming sky is an eerie, milky blue. We can see lava snaking its way down from the sparking crater of Pacaya, forming a red-hot squiggly line. The crater releases energetic puffs of smoke and looking around, I feel as if I’m standing on another planet. 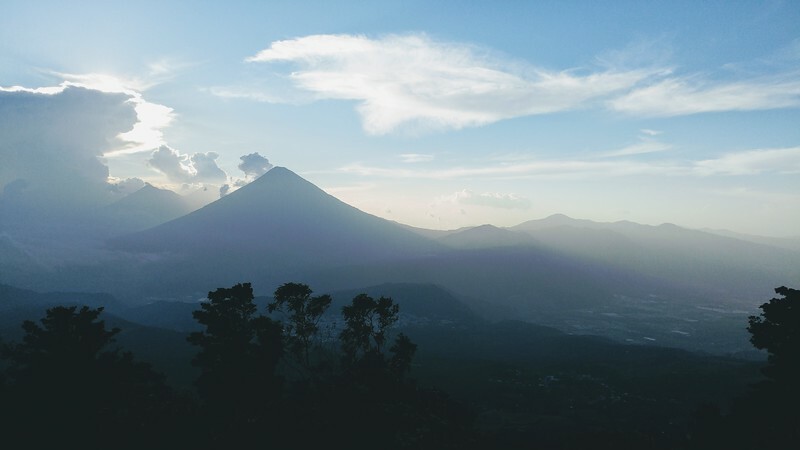 Although Pacaya isn’t the highest in Guatemala, the view is soaring enough to make you think that there couldn’t possibly be anything higher than its clouds. Looking for a place to stay in Antigua? Start your search for hotels in Guatemala with us! Heading back down was just as beautiful. Before making our descent, Edwin locates a rocky patch of the volcano that is hot, still smoking. This part of the volcano he jokingly calls his “playa” (beach). He spears marshmallows on sticks and roasts them for the group. After two hours of climbing, I couldn’t imagine a sweeter treat. 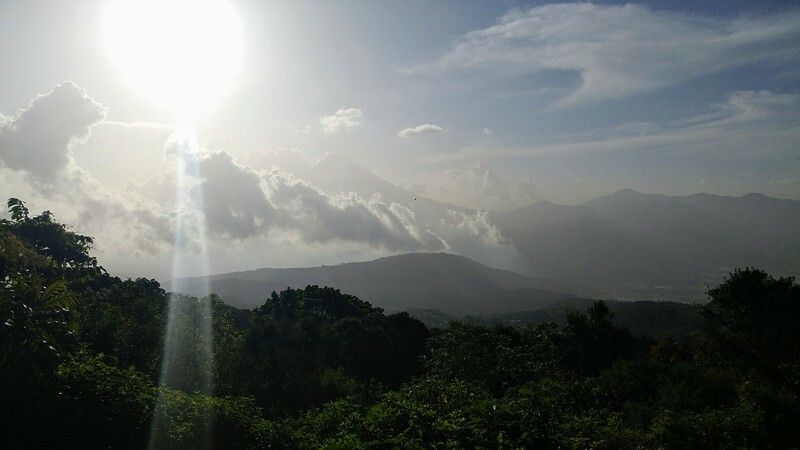 Does hiking in Guatemala sound fun to you? Have you ever hiked up an active volcano? Come join the conversation at the My Itchy Travel Feet page on Facebook. Or send us an email with your thoughts. Kirsten is a personal trainer and coach, as well as a language teacher. But when she's not working, she's an intrepid traveller. She's backpacked many parts of Europe, Asia and South America. Her favourite destination? All of them. Travel advice? Pack light.